Many tropical fish keeping enthusiasts regard the Molly (Poecilia sphenops) as one of the most popular aquarium fish, but because of their fast growth rate, birth size, reproduction rate, and brood numbers, they have also become a primary feeder fish in the aquarium hobby. Except for the Endler’s livebearer (Poecilia wingei) and the well known Guppy (Poecilia reticulata) all species in the Poecilia genus of livebearing fishes are known as mollies (Poecilia sphenops). Common (or short fin) mollies are found in the southern part of the United States to the Yucatan in Mexico and are native to fresh, brackish, and salt water environments. Mollies are mildly aggressive, thrive in brackish water estuaries, and can grow to a maximum length of about 5 inches, but in an aquarium environment, they seldom exceed 3″ in length. Selective breeding over centuries has produced several varieties of color variations, fin, and body shapes. The Short Finned Molly (common molly): These fish inhabit the fresh water streams, coastal brackish and marine waters of Mexico. Wild specimens are a dull, silvery color, suffused with brown and green hues and are rarely kept as aquarium specimens. 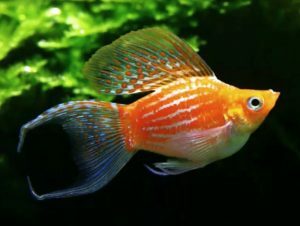 The Short Finned Molly is able to produce fertile hybrids with many Poecilia species, the most spectacular being the sailfin molly. The Balloon Molly: The Balloon Molly, due to a genetic defect, has a deformed spine that gives it it’s characteristic appearance. Through selective breeding, it is widely available to tropical fish keeping enthusiasts and is a popular community tank fish. 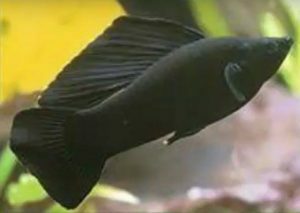 The Black Molly: As the name implies, the Black Molly is totally black throughout, and is one of the most well known aquarium fishes. Black Mollies are prolific and easy to house. 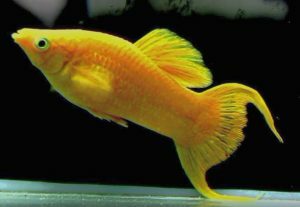 The Golden Molly: Golden Mollies are often sold as the “24 karat” molly. The Lyretail Molly: Lyretail mollies are selectively bred to have an altered caudal fin structure. 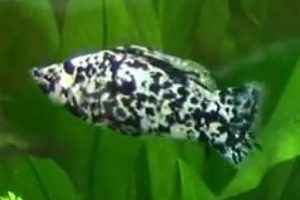 The White Molly: This species is a totally white colored molly. Because Mollies are not very very aggressive, they make suitable tank mates for most community tanks. Mollies prefer a well lit tank of at least 30 gallon capacity with plenty of strong plants such as Java Fern , Sagittaria, Vallisneria, or Anubias. Because they are vegetarians, they do best in an aged tank with plenty of algae for them to graze on. They have hearty appetites and require a good filtration system to remove the resulting waste products. If your tank has no algae, they MUST be provided Spirulina flakes, herbivore flakes, or chopped boiled spinach to supplement their diet. Mollies are best kept at a temperature of at least 78F. and although they are not very demanding when it comes to water quality, many tropical fish keeping enthusiasts recommend adding 1 teaspoon of sea salt per gallon to the aquarium water for optimum health. 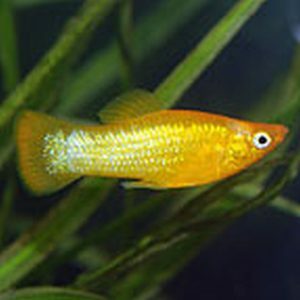 Mollies are a versatile species and like guppies can be slowly acclimated to live in either freshwater or full strength saltwater. Like most live bearers, Mollies are prolific and easy to breed. A spawning box in a large breeding tank or an aquarium that is planted as densely as possible with a thick layer of algae and some floating plants to promote rearing the fry is all that is required. Female Mollies give birth to anywhere from 10 to 60 young every 60 to 90 days. The young are already formed and are approximately up to half an inch long at birth. Mollies are omnivorous and eat meaty foods as well as algae. Although they must be fed an algae based flake food, pellet, or wafer, they should also be provided with fresh, frozen, or freeze dried bloodworms, tubifex , brine shrimp, etc. All varieties of Molly are commercially breed and readily available in tropical fish keeping shops throughout the country at reasonable prices in various sizes. Medium size is generally 1″ to 1 1/2″, Large size about 1 1/2″ to 2″.